Over the last few months I’ve covered fabricating Hedley, my robotic skull. I was originally looking around for a way to research, understand and develop uses for the JeVois machine vision sensor. This cutting-edge sensor uses a quad-core ARM chip running Linux and artificial intelligence (AI) programs to analyze and respond to things that come into Hedley’s field of view. The module comes packaged with a built-in miniature video camera, wrapped up in a 1x1x3/4-inch blue plastic cube. While aimlessly wandering the local Target store aisles around Halloween, I spotted a cheapo plastic skull, that I thought would work perfectly with the JeVois sensor. Making a skull visually track a person and training it to speak has been challenging and fun. As you would expect, the project has morphed into adding pan and jaw servos, a three-color LED left eyeball, a separate Arduino to manage the jaw and a Raspberry Pi for general computing and video (JeVois sensor playback) operations. Along the way, I also built the internal brass tubing framework and mounting system for putting the skull on a table stand or in a box. Is fabbing up your own robotic skull the only way to go? The answer is a resounding nope. After searching for “robot supplies” and “robot skulls” for a while, I’ve finally hit pay dirt. Today we’ll look at a few robotic skull specific sites, just in case you don’t want to build from scratch. Be warned, pre-fabbed robot skull prices can be a little frightening. Check out Monster Guts. Its tagline, “Monster Guts, it won’t work without them” is pretty descriptive. Instead of saying its forum is “now live,” it’s “now ALIVE.” I like the tongue-in-cheek humor. As we’ve talked about in the past, drama and putting on a good show are very important for attracting attention. I think Off-The-Shelf Hackers will get a kick out of the site. Monster Guts bill themselves as a place for animatronics and prop makers. They also offer some pretty sophisticated robotic skull kits. The three-axis skull elite product comes with the skull, their custom pan-tilt-nod mechanism with servos, 2-axis eye mechanism and optional colored LED eyes. I priced all the high-end options and came up with a figure of around $835. You’ll have to supply your own control electronics, software, power supply and mounting hardware. I’m now actively searching for funding to get one in the lab. Is it expensive? Maybe, maybe not. You should take a look at the demo video before passing judgment because their skull’s capabilities are pretty impressive. The video also talks about their upcoming holographic eyes option. Slick. A bigger question is how do you leverage all that authentic movement and animation for your purposes. In my case, Hedley will assist me with my speaking gigs. I’m taking him to Minneapolis for the Embedded Systems Conference, at the end of October. The conference folks want me to come up and talk about how I put him together. Hedley will also probably join me at OSCON, in July. 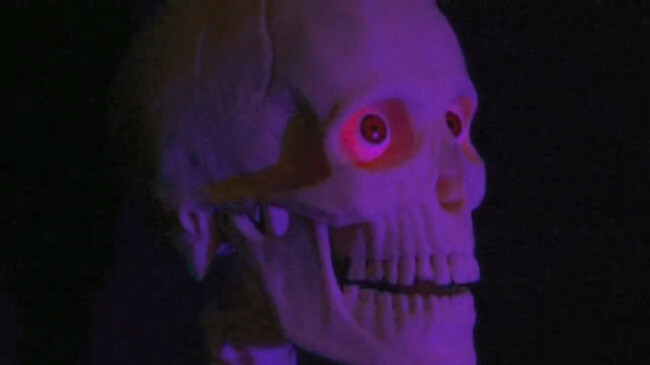 Halloween Skulls builds 3-axis skulls that use the DMX control system for movements. It offers complete skulls with servos for prices comparable to Monster Guts. DMX is a standard protocol frequently used in theater and show production to control lights, gadgets, motion mechanisms and so on. You can generate DMX commands from a console, computer and even send it over network connections. The devices daisy-chain together in a bus arrangement and have assigned addresses. Commands get sent to the specific address to control each device. The protocol allows systems of devices to be automated with a script, including robotic skulls. DMX works from Linux computers and with microcontrollers like the Arduino and Raspberry Pi through libraries. You’ll probably need a USB to DMX adapter. Here’s one from Amazon. Another thing that sets Halloween Skulls apart from other vendors is that it 3D prints its own skull systems. The parts fit neatly together and largely eliminate joints that take away from the aesthetics of the skull. Assembly is with simple hand tools. Skulltronix makes skulls for theme parks, restaurants, “home haunts” and commercial attractions. Like Halloween Skulls they make their own plastic parts and use the DMX control protocol. It also markets its own Board-of-Chuckee servo control boards. They’ve even developed several canned animated songs that make their skulls follow a script. Aside from skulls, Skulltronix also has other haunting and Halloween props, including chests, crates and an ultra cool Track Skull Live Action system. The company uses reflectors on a ball cap, an infrared video camera and software to sense the motion of an actor’s head to drive the action of the robotic skull. The system is designed for live performances in front of audiences. It also simplifies recording skull animation sequences for later playback. Wow, I wish I’d thought of making a head motion tracking system for Hedley. Looking at other people’s work is a viable way to come up with your own spooky new ideas. Off-The-Shelf Hackers increasingly have the option to build or buy. Certainly, 3D printing is opening up a new world of custom/prototyping. Project packaging and the mechanisms are just as important as the rest of the parts in a physical computing project. And, keep in mind the end goal of producing something that actually does a job. Buying robot skull parts, once you understand the fundamentals can speed up production and help you get a project out the door.